The CD34 antigen is a monomeric transmembrane phosphoglycoprotein of about 110 kDa with two distinct extracellular domains. The membrane proximal domain, of about 110 amino acids, probably adopts a globular conformation. The NH2-terminal domain, of about 140 amino acids, is heavily glycosylated with both N-linked glycans and sialylated O-linked carbohydrates and probably exhibits an extended rod-like structure typical of mucin-like glycoproteins. 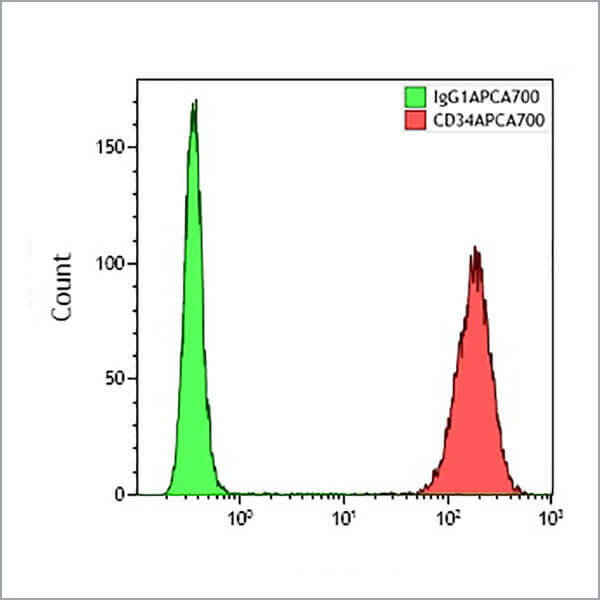 The CD34 antigen is expressed on hematopoietic progenitor cells of all lineages as well as the most primitive pluripotential stem cells. CD34 antigen expression is highest on the most primitive stem cells and is gradually lost as lineage committed progenitors differentiate. The CD34 antigen is also present on capillary endothelial cells and on bone marrow stromal cells. Variations of glycosylation are thought to occur during normal hematopoiesis depending on lineage commitment and the level of cellular maturation. *Alexa Fluor and Pacific Blue are registered trademarks of Molecular Probes, Inc.
Clone Description Epitope Class III: Clone 581 recognizes a sialidase / glycoprotease / chymopapain insensitive class III epitope.